After two months of almost constant work a contingent of workers from Ione's service clubs and good Samaritans had nearly completed their tasks as the day of the event arrived. Four hundred and sixty seven tickets were sold and about four hundred and fifty hungry people were fed. This was called the best crab we had ever served by several very pleased patrons. The arrival of the Norovirus to our area as well and colds and flu took a toll on some ticket holders. Some partners and spouses were able to take dinner’s home to their shut-ins but everyone else ate until they burst. By all of our standards the dinner was an outstanding success and we look forward to many additional fundraisers that will be held in this rejuvenated facility. Many of the Ione Rotarian's and our patrons are people of the land, who for generations have invested their sweat and resources here to make things grow. 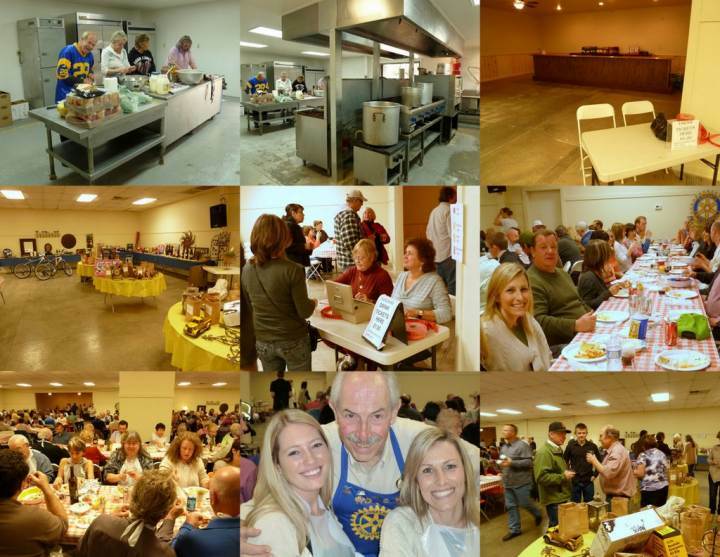 Ione Rotary supports that model and plows all of the proceeds of these fund raisers back into the Ione community. Supporting our youth through scholarships, reading, music, the arts, their Agra-business projects at the Fair and a variety of leadership camps; Ione Rotary helps them achieve their goals as well. A thriving business base and job growth are keys to the sustainability of any community and we are committed to helping our businesses' grow and shopping locally.